High efficiency of creation of a beam of accelerated particles and accordingly - high radiation dose rate. Maximum automation of the treatment process. 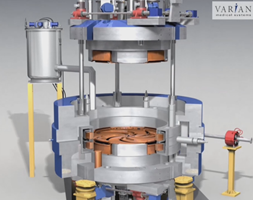 A special design feature of the Varian ProBeam® system is the use of an isochronous cyclotron with superconducting electromagnets (the so-called superconducting cyclotron). Its energy capabilities allow delivery of radiation doses to tumors lying at a depth of 4-30 cm, providing the widest range of energy for treatment - without the use of range switches. There is no need for a warm-up phase, since the cyclotron operates continuously in the maximum efficiency mode. A beam of charged particles is produced continuously. A pillbox design with an automatic top pole lifting system increases the ease of maintenance. A compact internal ionization source reduces the cost of the equipment. Compact footprint reduces installation costs. No need for high-energy electromagnets, the installation of which requires the removal of heat. Superconducting electromagnets of an isochronous cyclotron provide high efficiency in producing a beam of charged particles, low power consumption, excellent reliability and reduced operating costs. In contrast to other installations, the Varian isochronous accelerator operates in a very predictable manner. Processes are automated as much as possible, there is no need to configure the cyclotron by the operator. 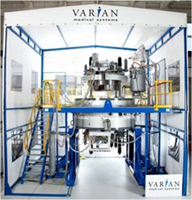 The Varian isochronous cyclotron has compact dimensions and high thermal stability. It became the first isochronous cyclotron available on the market with superconducting electromagnets for medical use and has been in use since 2007. A continuous and stable proton beam is able to perform proton therapy with modulated intensity in a shorter time and with a more conformal dose than when delivered by passive scattering (although passive scattering is now used in most proton therapy centers). The choice of the type of dose delivery is an important point for the treatment of the disease. Passive scattering is the proton therapy of the previous generation, a technique used by most of the long-operating centers. 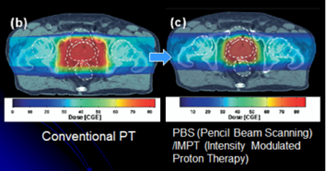 To date, pencil beam scanning is a more accurate type of proton therapy, and most new proton centers choose it. Why is pencil beam scanning technology the best? To deliver the conformal dose to the target, this technology uses beam forming devices that are manufactured either by the Center itself or purchased from suppliers. Patients need to wait for the manufacture of such devices. The beam-forming devices become radioactive during the treatment and must be stored for months after use (for which the center requires a specially allocated place). When the scattered beam of protons contacts the scattering material or beam forming device, it creates neutrons - secondary radiation. Secondary radiation irradiates a healthy tissue located near the target. 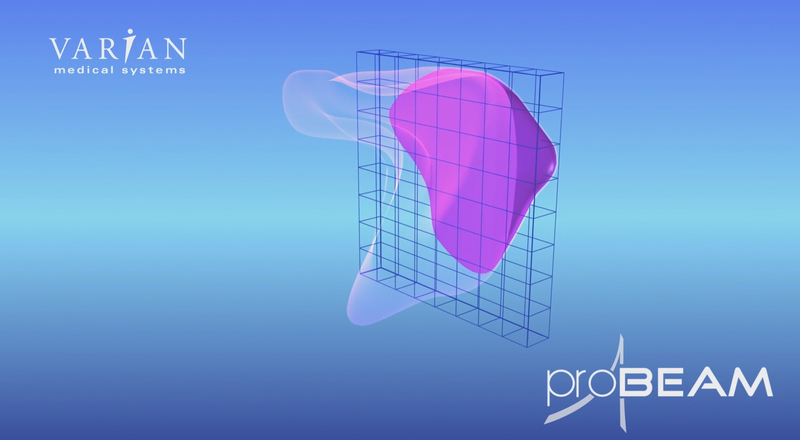 When protons collide with a scattering material and beam forming devices, they lose energy or narrow the range of irradiation action necessary to treat the patient. With passive scattering it is more difficult to achieve the delivery of the optimal dose to the target. Although passive dispersal may be more preferable over conventional radiotherapy, it does not provide the maximum effect that the modulated intensity proton therapy provides. The greatest effect from irradiation with protons is provided only by pencil beam scanning. Pencil beam scanning (PBS) or scanning with a sharply pointed beam is the advanced method in using protons for the treatment of cancer, which is used so far in just a few proton centers of the world. The team of the MIBS Proton Therapy Center has mastered the PBS technology. The "pencil" beam scanning technology is based on complex treatment planning systems and multiple magnets, which direct a narrow proton beam effectively "painting" the dose of radiation layer by layer. A highly targeted beam of protons moves along the vertical and horizontal axes, like the tip of a pencil "painting" the entire tumor. In the process of beam movement, its intensity is modulated. Radiation of the maximum permissible intensity is delivered exactly to cancer cells avoiding normal tissues. Pencil beam scanning is very effective in the treatment of the most complex oncopathologies, such as prostate, brain, eye, cancer in children. Proton therapy with modulated intensity is the most suitable for delivering a powerful and accurate dose of protons to complex or concave tumors that may be near the spine or inside the head, neck or skull base.